Nautical refers to the sea and to ships. There is a romantic image of life on the sea reflected in a navy jacket with brass buttons, a crisp white sailor's uniform, a sou'wester hat and yellow slicker, or a fisherman's sweater. All sailors and those whose occupation depends on the sea deal with the unpredictable nature and allure of the sea. Protection from the salt water, wind, and sun is a primary consideration along with allowing the mobility needed to perform the duties of their job on a ship among the ropes, nets, and sails. 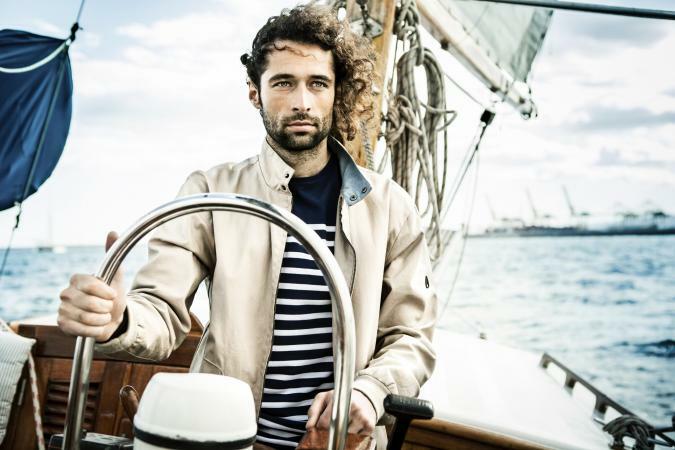 Historic traditions in nautical dress continue to influence modern nautical apparel. The "Jack-tar" describes a sailor of sixteenth century Europe who wore a waist-length tarred leather jacket and hat for water protection. To facilitate movement on the ships, loose breeches called "slops" and tunics of canvas or coarse linen were worn. The slops were often striped or red in color. In addition, a tar-coated canvas petticoat called a tarpaulin was often worn over the slops during rough weather. A neckerchief and knitted woolen cap provided additional protection for the head. The tarred jacket has evolved into the classic pea coat of today, while the tarpaulin remained prevalent with fishermen through the nineteenth century. With the birth of an official Navy uniform in England during the mid-eighteenth century, there was a more noticeable distinction between the occupational dress of a sailor and a fisherman. Blue and white with gold and silver trim for officers was the designated color palette for the Navy. This was the origination of the term "navy blue." Later in the century, American-tar wore a short blue or black-tarred jacket, cropped trousers with a knitted striped shirt, and neckerchief. Sailor hats were now made of oilcloth, a recent innovation in waterproofing that treated cotton or linen with boiled linseed oil. The oilcloth was also used in bib trousers and jackets, their yellow color serving as a safety feature for sailors who were blown overboard. A knitted wool gansey or jersey became popular during the mid-eighteenth century. These tightly knitted sweaters button on one shoulder and were patterned to represent the town of the sailor. Solid colors were reserved for naval officers, while the sailors wore stripes. The jerseys were often embroidered by the sailors with the name of the ship on the front chest. Naval uniforms continued to evolve during the nineteenth century with the use of the sailor collar and black neckerchief that mimicked the wide collar points and black cravat worn by fashionable gentlemen. Sailors maintained variations of the blue waist-length jacket and white trousers while officers wore a gold-trimmed coat that was short in the front with tails in the back. Twenty-first-century naval officers have a white dress uniform of jacket and trousers with brass buttons and epaulets, while their service uniform is built of a navy blue jacket and pants with white shirt and black tie. The enlisted sailor wears white trousers and a tunic with a sailor collar and black tie. It is affectionately referred to as a "monkey suit" (Wilcox 1963, p. 82). Present-day commercial fishermen consider function and safety with their use of insulated layers of fleece and waterproof hooded-jackets and pants. Orange and yellow gear provides good visibility in case of a water rescue. Traditional sailing garments have had a large influence on recreational and sport sailing apparel. Sailing as a competitive sport is marked by the first international yachting event, the Hundred Guineas Cup, in 1851, and its Olympic debut in 1896. The term yacht evolved from the Dutch "jaghtschiffs," which were boats designed to chase pirates. Yacht clubs developed to encourage and support the sport of sailing. Dress for most active recreational sailors needs to provide the same function and mobility required of professional sailors. Navy blue, white, red, and yellow are garment colors associated with both professional and recreational sailors. Navy jackets with brass buttons are a popular image, borrowed from the Navy, for the more social yacht-club member. Traditional sailing garments have also been a popular influence for generations of children's garments. Sailor suits are a classic design for both boys and girls that began during the mid-nineteenth century when Queen Victoria began dressing her children in the style. It spread quickly through Europe and America, continuing to be a classic children's style in the twenty-first century along with the middy blouse. Women have historically been on shore professionally until 1942 when the U.S. Navy began to allow women to serve in positions on ships. Their uniforms were similar in style to the men's with the addition of a skirt. A 1931 Vogue cover shows a woman in full bell-bottom navy slacks with a red, white, and blue striped top designed for lounging rather than rough seas. A later 1956 image shows a woman on a small dinghy wearing cropped denim jeans, a white "sloppy joe," white deck shoes, and red bandanna on her head. This outfit is intended to be comfortable and functional, but designed only for good sailing conditions. Women have dramatically increased their skill and participation in competitive sailing. Dawn Riley led the first all-women's America's Cup team in 1995 and was the first female member of the winning America 3 team in 1992. The garments worn by competitive sailors in the twenty-first century have the same requirements of protection from the elements and good mobility. However, innovative fiber and textile developments can now better protect the body, increase health and safety, and improve the wearer's sailing efficiency. Though wool has traditionally been the fiber used for insulation and water protection, apparel-layering systems take advantage of new fiber technology to help maintain the body's thermal balance. The first layer uses olefin to wick away moisture from the skin, while polyester fleece acts as an insulating layer to trap body heat. The outer-layer fabrics, such as Gore-Tex, provide a waterproof, yet breathable barrier from water and wind. The use of spandex, a fiber with stretch, in the first two layers allows for garments that fit closer to the body while allowing a greater freedom of mobility. See also Jacket; Military Style; Rainwear. Cunnington, Phillis, and Catherine Lucas. Occupational Costume in England from the Eleventh Century to 1914. New York: Barnes and Noble, 1967. Wilcox, R. T. Five Centuries of American Costume. New York: Charles Scribner's Sons, 1963. 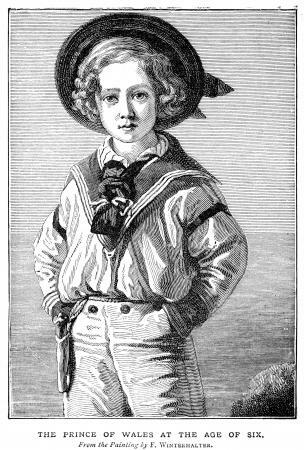 Naval Influences on Boys' Clothing. Naval Uniforms and Boys' Clothing. Previously available from http://histclo.hispeed.com/youth/mil-navy.html. Olympic History: Sailing. Available from http://cbs.sportsline.com/u/olympics/2000/history/sailing.htm .